Ok, I have been very slow to adopting Google Voice. I have not found a real use for it but it is slowly evolving and becoming useful to me. I opened my Google page this afternoon and it said “try Google Calling” so I did. 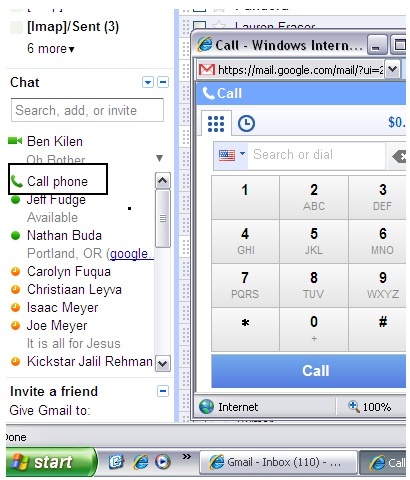 It seems to be similar to Skype (voip) and works within the US and Canada free. I am wondering if it work outside the US to call a US number without any charges. I talked with Moriah over GV and she thought it was pretty neat hearing herself on daddy’s computer. I like the possibilities. If anyone has found GV to be useful please contact me and let me know how you have been using it and what are the benefits. If you want my GV number email or text me.